The Toronto housing market has hit a cooling point since the Ontario government introduced a 15-per-cent foreign buyers' tax back in April. More recently, interest hikes have added more concern that the GTA real estate market will continue to cool off. 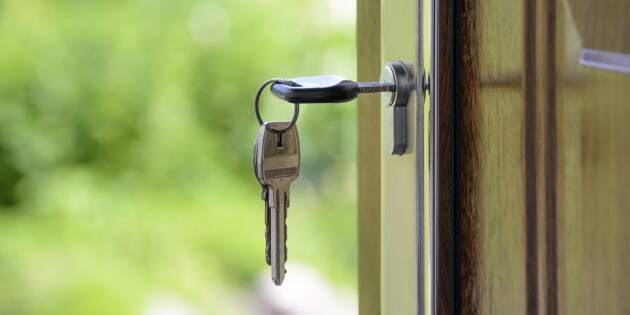 At the beginning of September, the Bank of Canada announced that interest rates will yet again increase, prompting a flurry of concerns about whether this change would affect the Toronto housing market negatively. Typically, higher interest rates are a big dampener of housing prices. Apparently we've already seen this during the Toronto housing bubble of 1989. 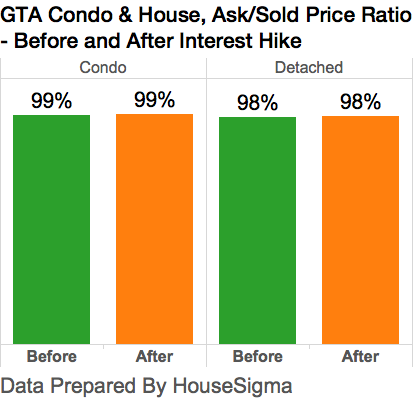 Data scientists at HouseSigma have compiled new metrics indicating that the increases in interest rates are not slowing down the sale of homes in the GTA. Instead, data trends have revealed that there hasn't been much of an effect. Sourced from a collection of housing statistics, HouseSigma has found that the market is actually experiencing a gradual increase in sales. A sign advertises a house for sale as Canada's central bank announced its first interest rate hike in nearly seven years, on a residential street in midtown Toronto, July 12, 2017. "To understand the true impact of the interest rate hike, we compiled the latest sold records from the GTA and extracted insights from different aspects of real estate," HouseSigma co-founder Joe Zeng states in the report. "Numbers never lie, and you can't tell the full story from only one set of numbers. It's very important for us to look at multiple metrics before driving conclusions." The analysis considers two periods before and after the interest hike: Aug. 18 to Sep. 5 (19 days in total), and Sept. 6 to 24 (18 days in total). By plotting out comparison charts, HouseSigma was able to produce highly relative data that points towards a stable housing market, one that is continuously escalating. Takeaway: Greater Toronto Area (GTA) housing prices appear to have increased over the two periods (as seen in the chart above). In both condos and detached homes, data indicates that median prices have increased by as much as $12,000. 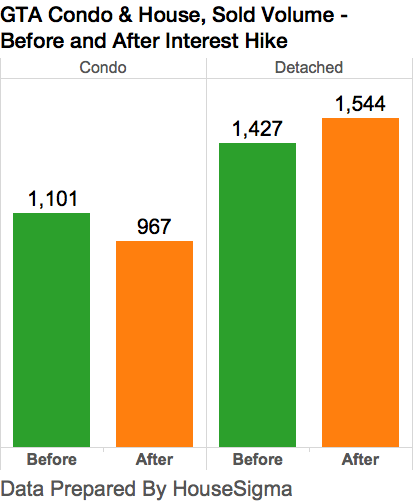 Condos appear to have increased from $448,000 to $460,000, and detached homes from $838,000 to $850,000. Takeaway: Another factor to note are the average days on market (DOM) per home. 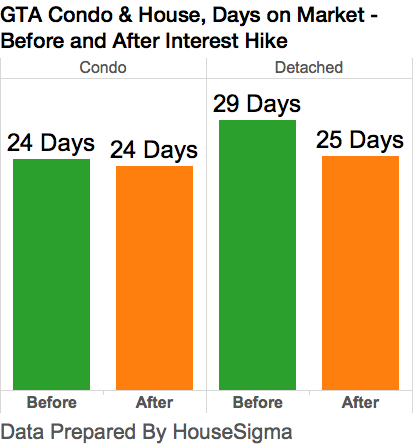 GTA condo data remains unchanged over the two periods, sitting at 24 days on market. Meanwhile, detached home DOM have actually dropped from 29 to 25 days on market after the interest hike. Takeaway: The detached house market took the largest hit after the new foreign buyer policy was introduced. 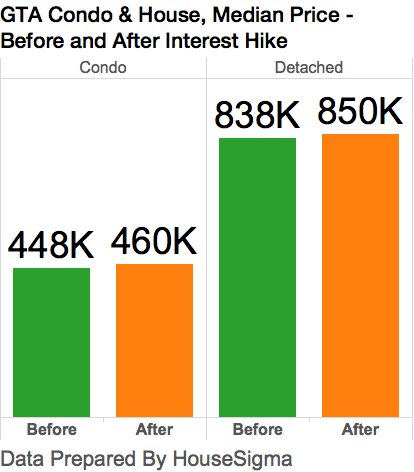 Most had expected detached housing might dip further after the interest hike. However, the sold volume for houses increased after the interest hike, while condo volume decreased by 10 per cent. It's possible that the warming detached market is taking buyers away from the condo market, especially after the pricing for detached homes began to drop in April. Takeaway: Asking/selling price ratios, a good indicator for market temperature, appear unchanged in both housing types. This indicates that homebuyers are not attempting to lowball, nor do they expect housing prices to decrease. For this reason, the asking and selling prices remain the same during both periods. While the Toronto housing market was extremely unstable after the new legislation, it appears that bank interest rate increases for borrowers have not made a significant impact. However, this begs the question: will interest hikes affect real estate in the GTA more aggressively in the future? By nature, the U.S. Federal Reserve has a direct impact on U.S. banks, which in turn, affect Canadian banks. BlackRock's Chief Investment Strategist for Canada, Kurt Reiman, believes there is nothing to fear. At the CUFICA Finance and Investment Forum, Reiman indicated that Canadian banks have more direct control than they did in the past. With a stable economic situation in Canada, domestic banks do not require the strong weight of control from the Canadian economy or U.S. banks. This analysis indicates that if there is another interest hike, unlike those made by our southern neighbours, it will be a moderate one — much like the two increases we've already seen this year from the Bank of Canada. CORRECTION: A previous version of this blog identified Kurt Reiman as BlackRock's chief investment officer. He is actually the chief investment strategist for Canada. This version has been corrected.